The FA Tesco Skills have been coaching in our school! This term FA Tesco Skills coach Tom Penny Has been delivering football skills coaching to children in Class 3 in PE Lessons. The Children have really enjoyed the FA Tesco Skills taking PE lessons and learning through games and challenges. 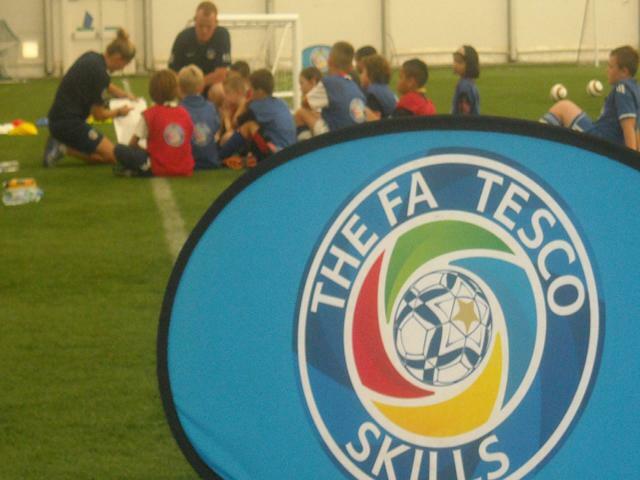 The FA Tesco Skills programme started in 2007 and the current team of 158 coaches has delivered over four million child places and supported 21,000 teachers in 7000 primary schools. The programme's unique child-centred philosophy has established it as the leading youth football programme in England. Its foundations are the FA's '4-corner' coaching model, delivering children socially, technically, physically and psychologically, giving them more than just football skills but life skills such as confidence, team work, decision-making and problem-solving. The coaching is also based on the FA's Future Game strategy, with the aim of developing young players who are comfortable on the ball, creative and have good game understanding. This commitment to deliver high-quality, child centred football coaching is delivered by expert, full-time FA youth-qualified coaches. All lessons are delivered in line with the National Curriculum for PE, ensuring that all sessions are planned and delivered to the highest standards. Beyond school, boys and girls of any ability and experience are encouraged to join the FA Tesco Skills programme, to experience expert football coaching with free sessions during the school holidays (except Christmas) and at after-school Skills Centres through the academic year. If your child would like to join an FA Tesco Skills Centre, the nearest one to school is in Penrith, at QEGS. Sessions are running from 5.30 till 7.30 on Friday evenings. There is also a FREE holiday festival days running every half term. Times are 10am to 12pm or 1pm to 3pm. Please see and book on line for these events. If you would like to find out more about the Skills programme and register your child for a session please visit TheFA.com/TescoSkills.